It’s hard to believe that it has been a year since I spent this amazing weekend with such a special friend of mine. Last May 2009, Mandy made the trip to Iowa City from Minneapolis to spend a weekend with me. 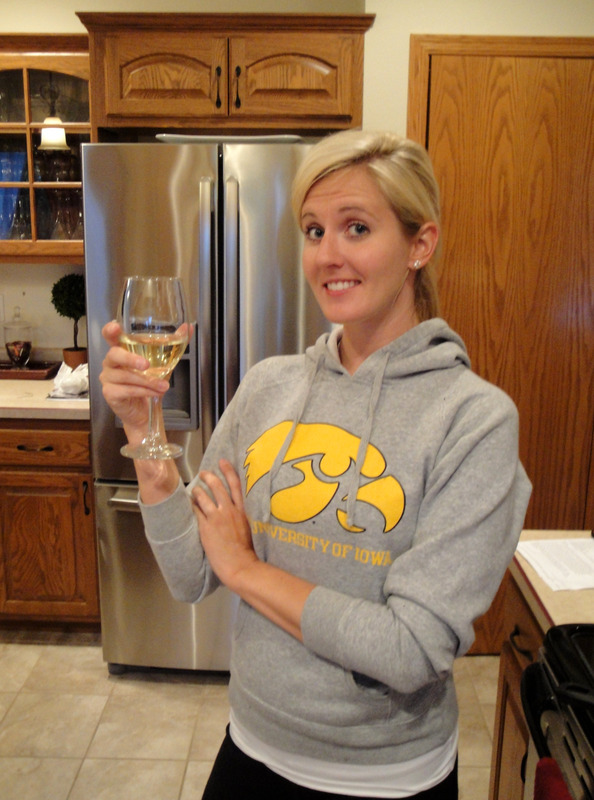 We had decided that it was time for girl talk…and vino…and our beloved cook-athons. We weren’t sure just what exactly we would attempt to create…but we knew it would be good…and a heck of a lot of fun in the process! We even managed to get in a “bathroom pic”…for old times sake. I often wonder why we took so many headshots in the bathroom while we were in college….even more so, I wonder where the time has gone. The next day we did some shopping and worked up an appetite for our evening cook-athon. On the menu….SUSHI! Neither of us had ever made sushi before but we figured it couldn’t be THAT difficult…. As we headed out to pick up our supplies, our first stop was: East West Oriental Foods. Sounded appropriate…And what we didn’t find at this Oriental Mart…we found at our local HyVee. I’m telling ya, HyVee is a one stop shop. They have it ALL! 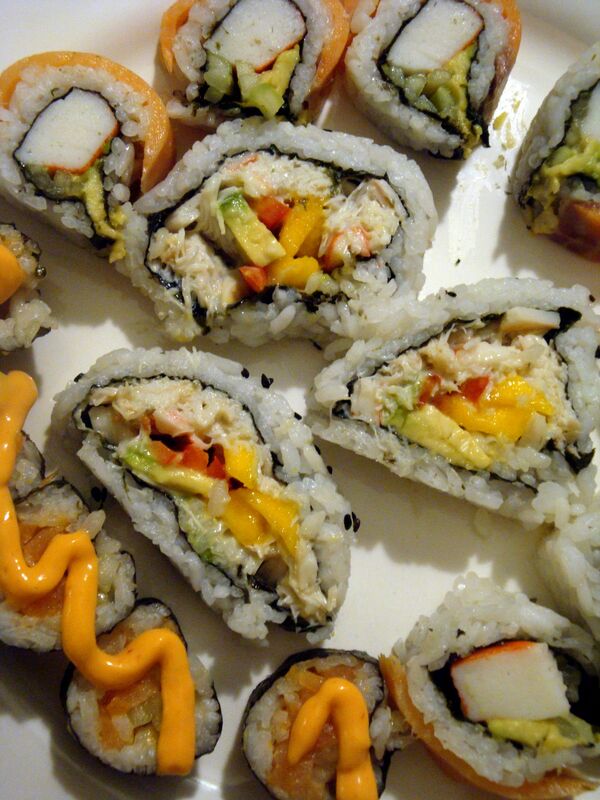 With our ingredients and supplies in hand, we whipped up Spicy Tuna Rolls, Mango Tango Rolls, and Avacado Crab Rolls. Chop tuna and mix with mayonnaise and rooster sauce. Combine the water and rice in a saucepan and bring to a boil. 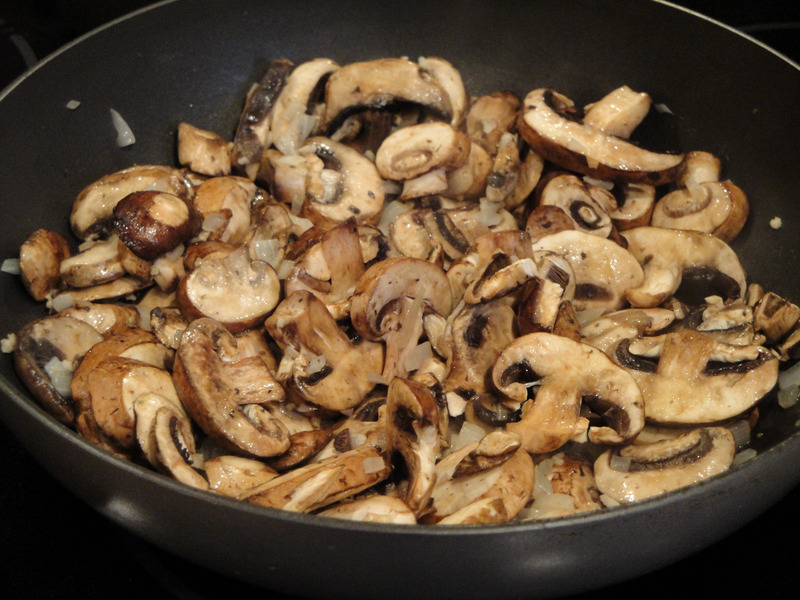 Cover, reduce heat to low and simmer for 20 minutes, or until rice is tender and water has been absorbed. 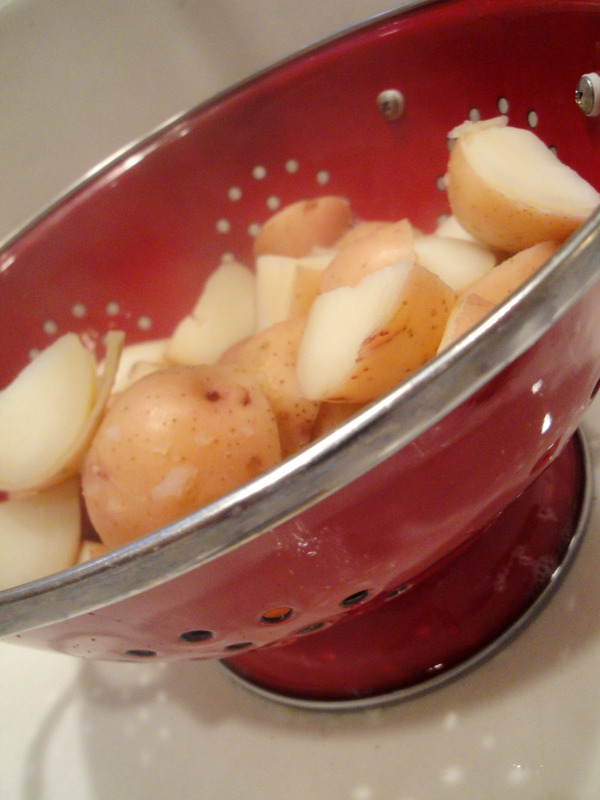 Remove from the heat and stir in the vinegar and a pinch of salt. Set aside to cool. Spread tuna mixture lengthwise. Position tuna about 1 inch away from the bottom edge of the seaweed. Sprinkle with sesame seeds. Lay cucumbers slivers on top. Use medium pressure to create compact tube. Remove the mat from around the roll, press in the loose ends and place it on a cutting board, seam side down. Using a wet, sharp knife, slice the roll in half then in 6 equal pieces. Combine mayonnaise and rooster sauce. Spoon the mixture into a sandwich bag. After cutting one of the bottom corners of the bag open, squeeze the sauce onto the top of the sushi rolls. Serve with wasabi, soy sauce and pickled ginger. 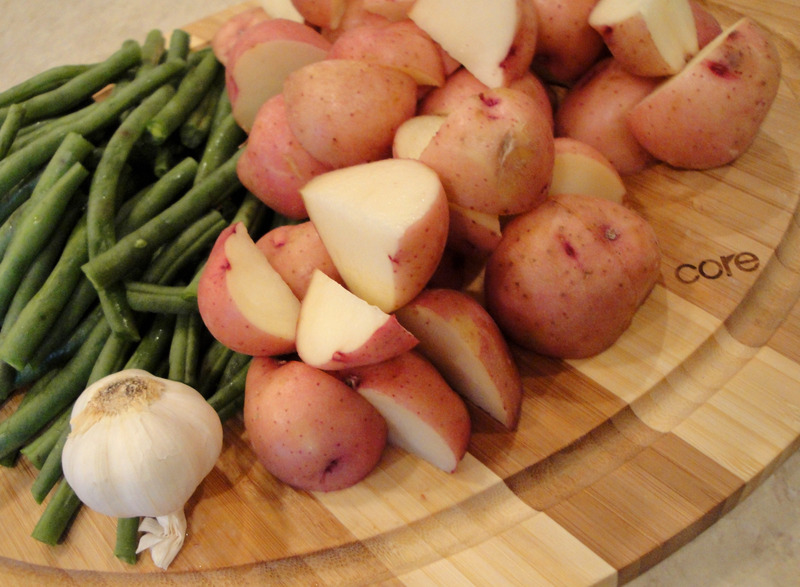 Once we had all of the ingredients prepped…learning how to roll was a challenge! So…naturally, I let Mandy take the first stab at it. LOL. So far…so good…. Ummm….oops! That didn’t turn out exactly as we had hoped. With Mandy’s recommendation (brilliant, by the way), we decided to YouTube some instructions. 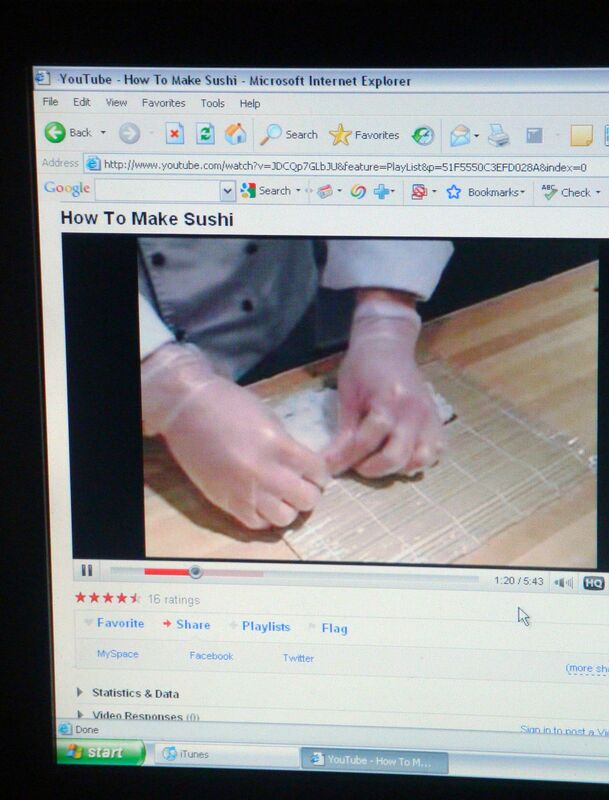 “How to Make Sushi”….exactly the tutorial we were looking for! And with that brief video clip…Mandy whipped up another one. This time…PERFECT! I wish I could say that I did as well on my first roll (even having watched the YouTube clip first)…but I wasn’t as talented. But…after a try or two…we were sushi-makin-machines! 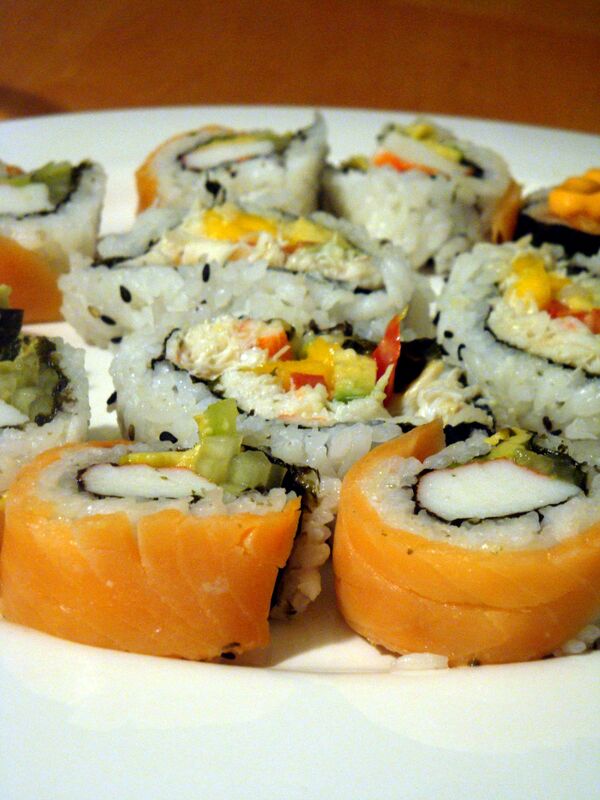 After putting togther our Spicy Tuna Rolls…we were onto the Avacado Crab Rolls and the Mango Tango Rolls! Tear a piece of plastic wrap and lay it on top of the bamboo mat. Lay smoked salmon fillets on top of the plastic wrap. Dampen your fingers in water. Spread a thin layer of sushi rice over the salmon/plastic wrap (approx the same size as the the half sheet of nori paper). Leave a 1-inch margin (nori should be 1-inch larger than the rice). Cut nori sheet in half and place it on top of the rice, shiny side up. Leave a 1-inch margin at the ends uncovered to seal the roll. 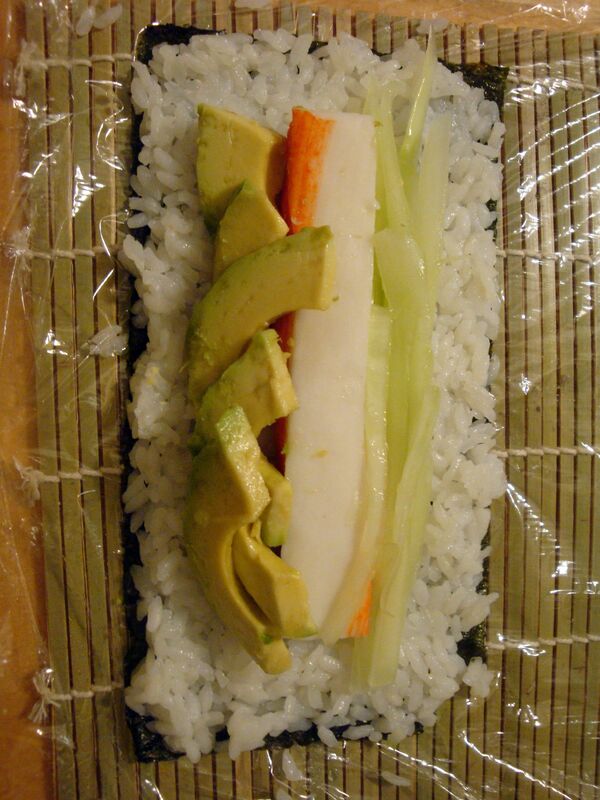 Lay crab, avacado, and cucumber lengthwise. Position them about 1 inch away from the bottom edge of the seaweed. To roll; slowly fold the end of the mat closest to you over the filling and tuck it in. Tear a piece of plastic wrap and lay it on top of the bamboo mat. Dampen your fingers in water. 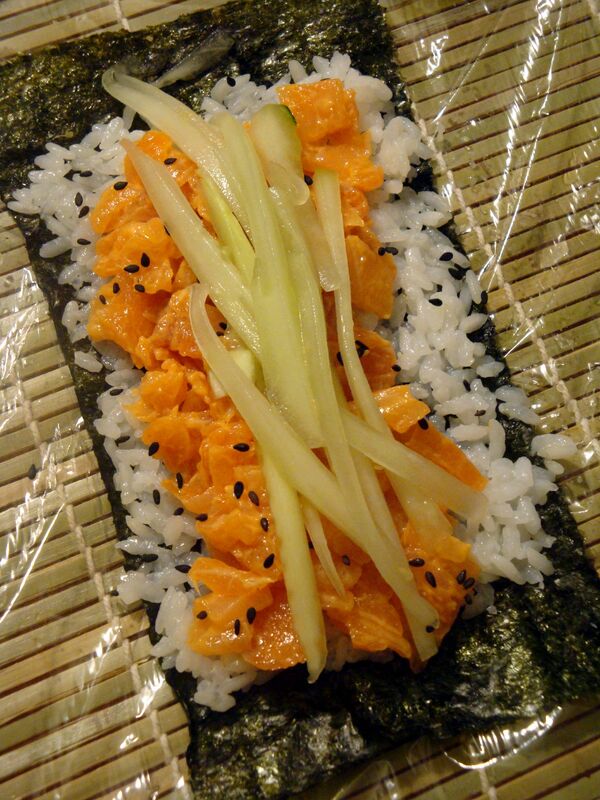 Spread a thin layer of sushi rice over the plastic wrap (approx the same size as the half sheet of nori paper). Leave a 1-inch margin (nori should be 1-inch larger than the rice). Cut nori sheet in half and place it on rice/bamboo mat, shiny side down. Leave a 1-inch margin at the ends uncovered to seal the roll. 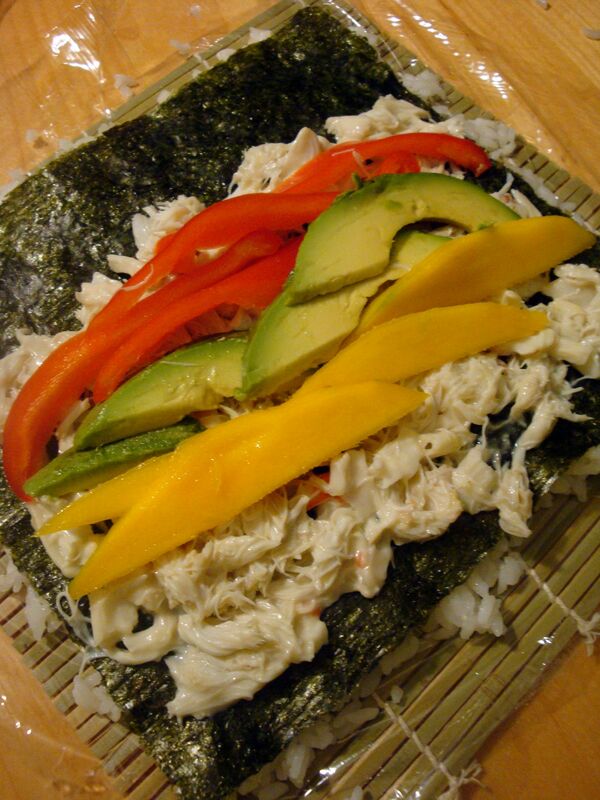 Spread shredded crab on nori sheet. Position crab about 1 inch away from the bottom edge of the seaweed. Top with red pepper, avacado, and mango. I’m not gonna lie…this little cook-athon took several hours! We started our shopping for groceries at 6pm…and were eating our dinner at 10pm. But those 4 hours were full of laughter, love, and learning. Mandy…we need to do it again soon. Thank you for visiting me…cooking with me…and always being there for me. Love you! 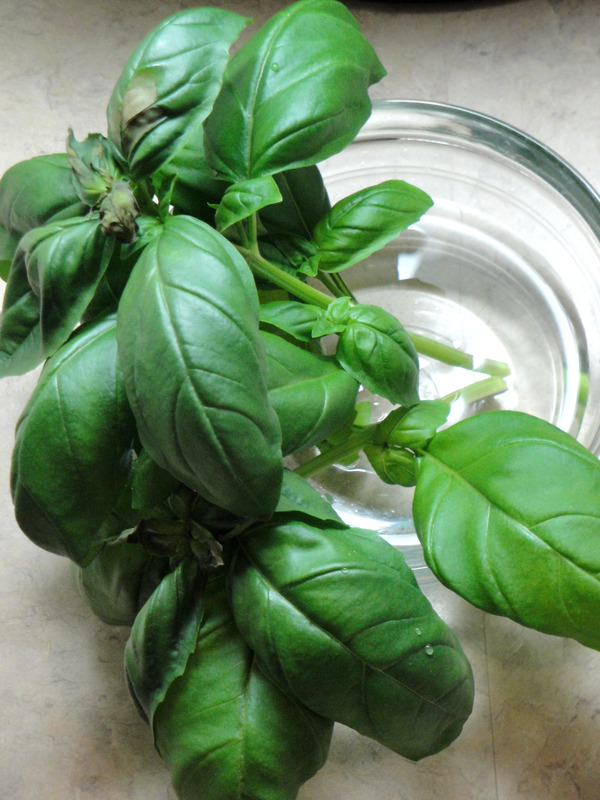 If you love to cook…and you’re anything like me, you would agree that there is no substitute for fresh herbs! 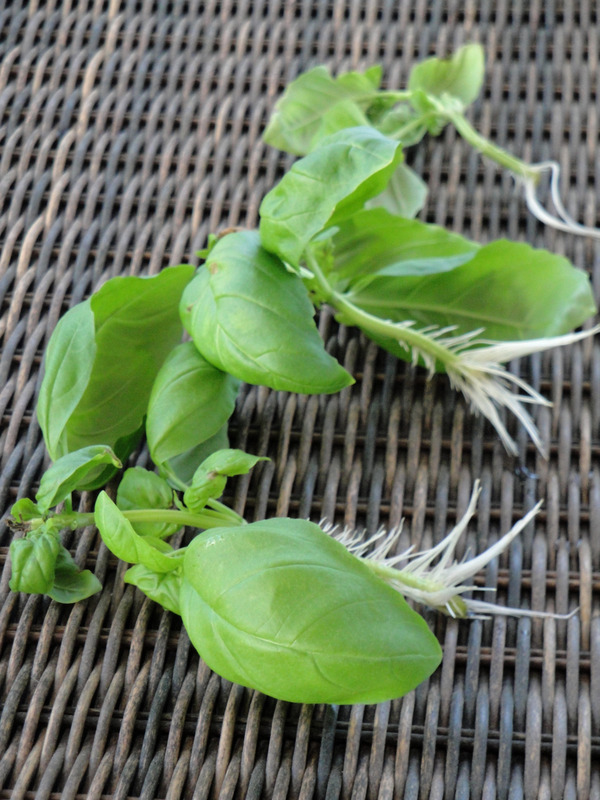 Just like the delicious aroma and robust flavor of freshly minced garlic, freshly chopped herbs can make all the difference. 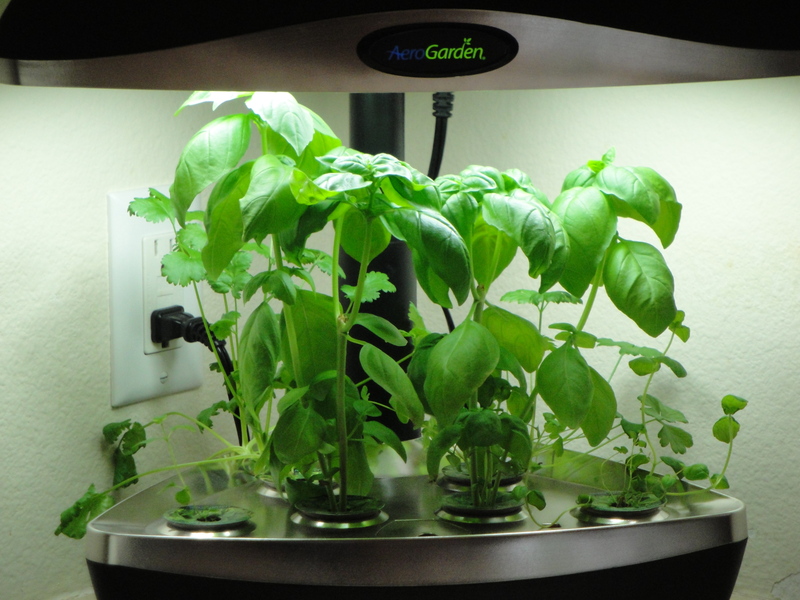 That being said…you can imagine what I was spending on herbs at the grocery store. 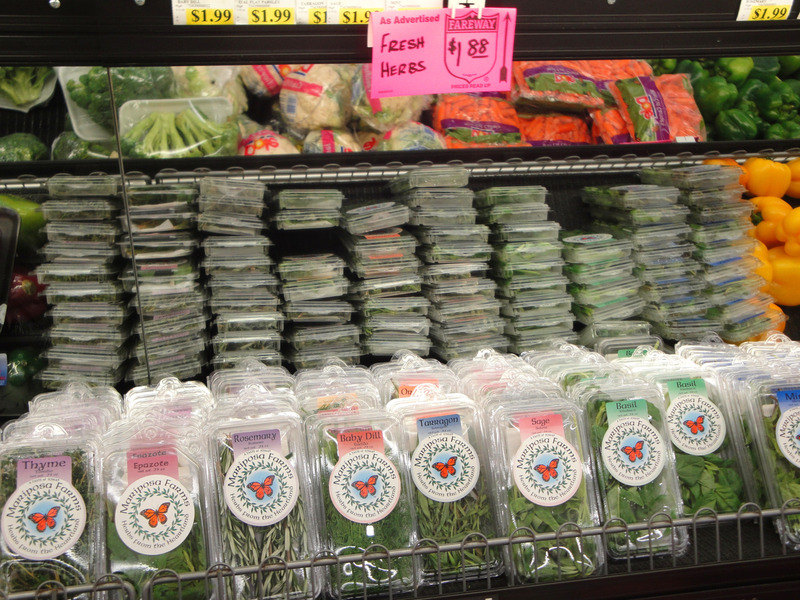 HyVee typically runs their herbs at 2 for $5….and at Fareway, you can often get out the door for $1.88…but even that quickly adds up at our house. The instructions that accompany the unit are really very easy. 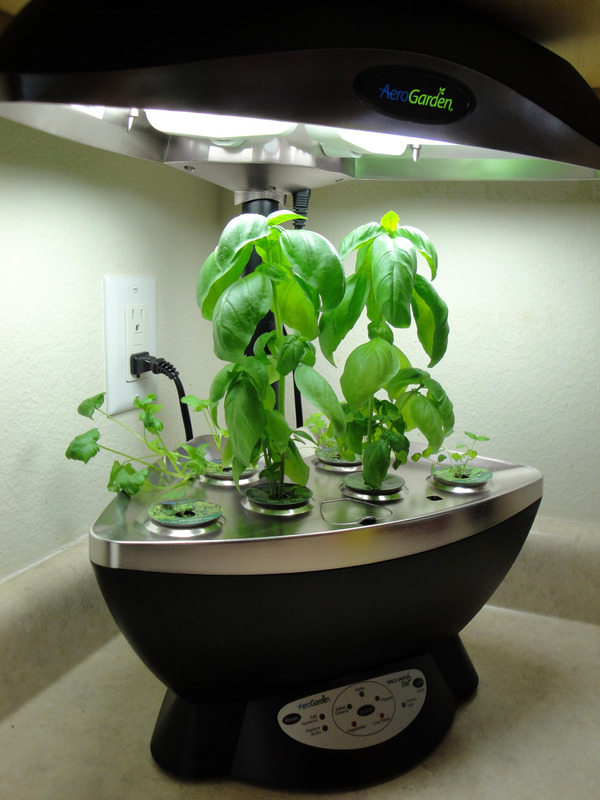 Essentially, attach the top of the garden to the base, install the lamps, plot out your seeds, add water & nutrients (enclosed), plug in, and set lamp timer. I chose the garden that accomodates 6 plants. 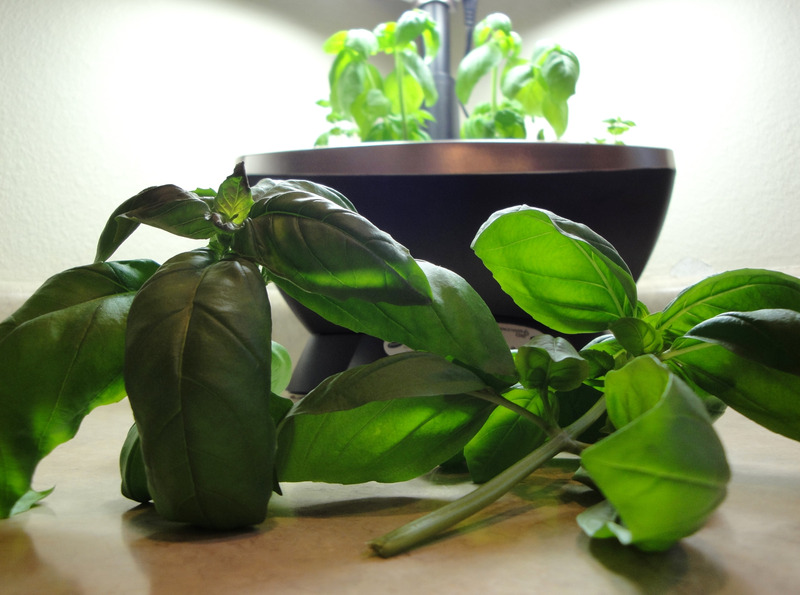 The most commonly used herb in our kitchen is Basil…so I chose 2 Basil plants along with Cilantro, Oregano, Parsley, and Mint. 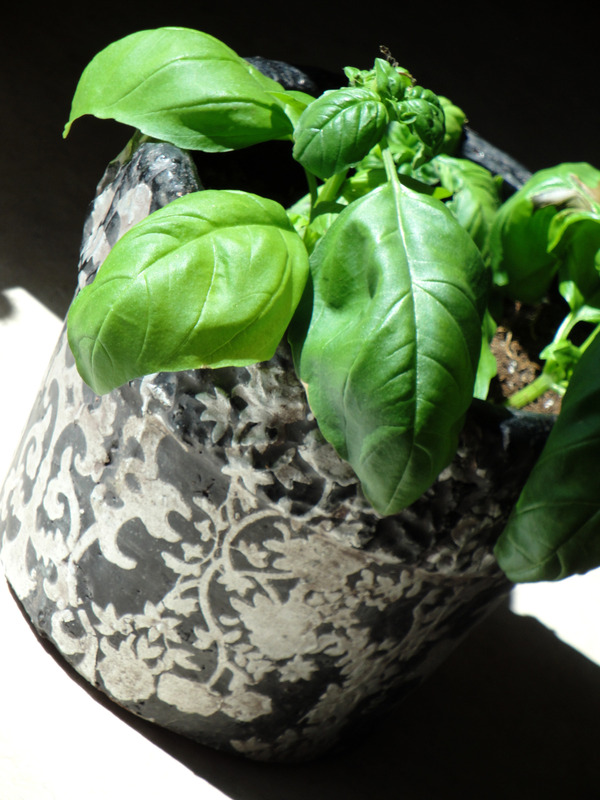 I would have loved Rosemary…but it wasn’t an option online….so I have that one potted outside. I’ll save my outdoor herbs for another post! 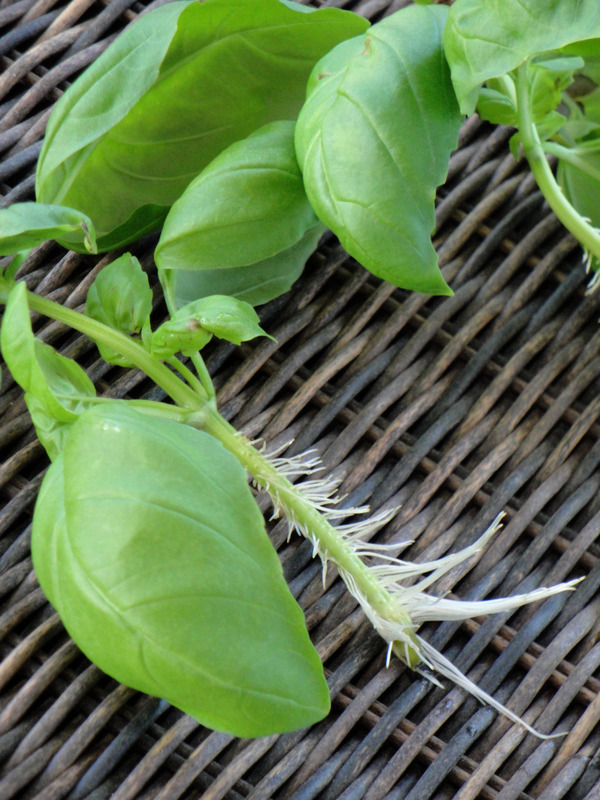 The Basil was the first to pop up. 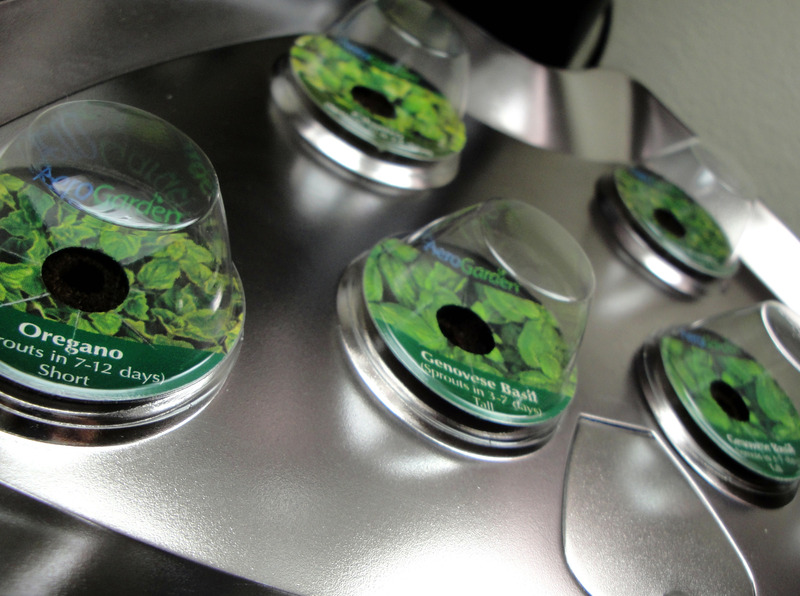 There is something SO rewarding about watching the seedlings sprout! 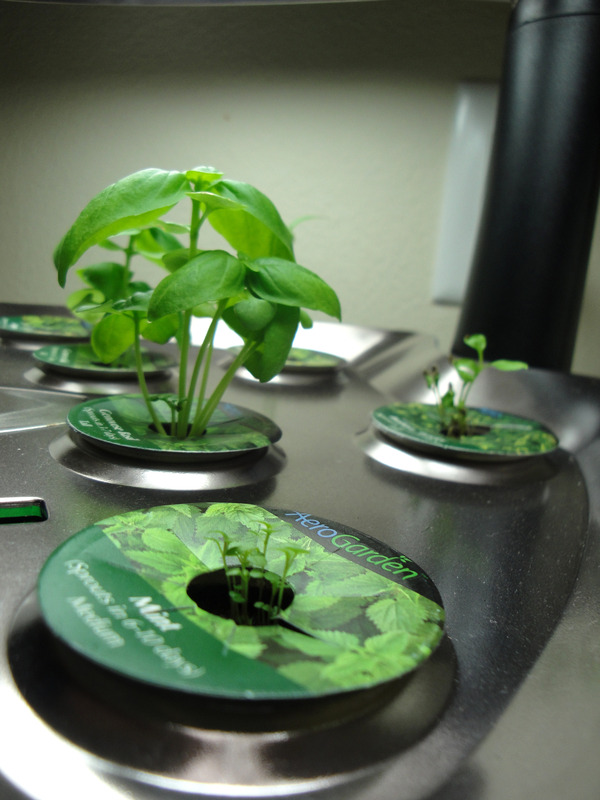 Check it out…they are all sprouting! And just a week or two later…we are off to the races! 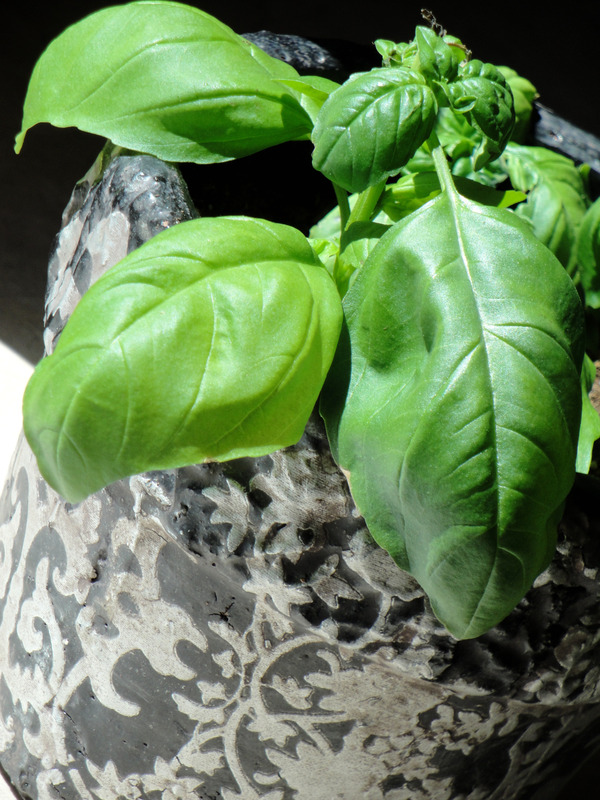 The Basil is out of control…and even we can’t keep up with it. With that, our first clippings. I used a handful here and there for our favorite Caprese Salad…but wasn’t sure what to do with the rest of the clippings…certainly I didn’t want them to go to waste. 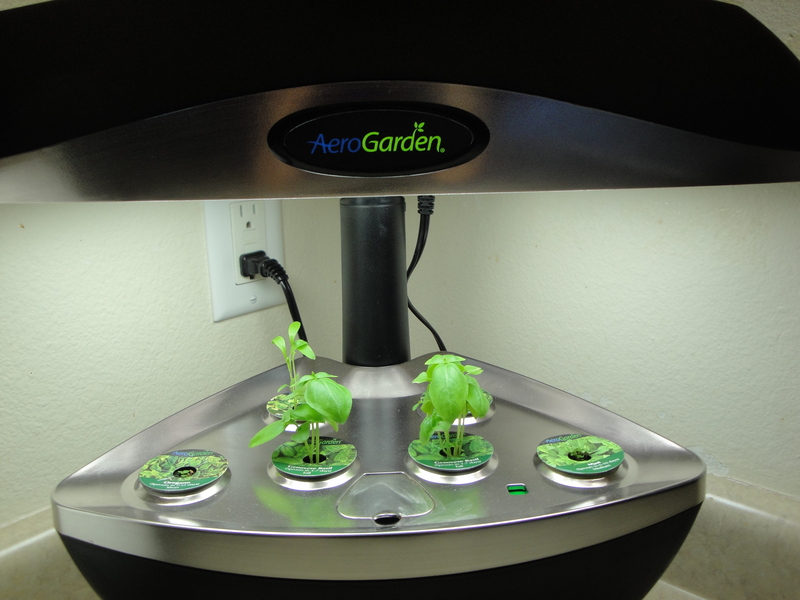 I decided that I would keep my clippings in a bowl of water, near the AeroGarden Lamp, and see how long I could preserve them. To my surprise, they held up well! 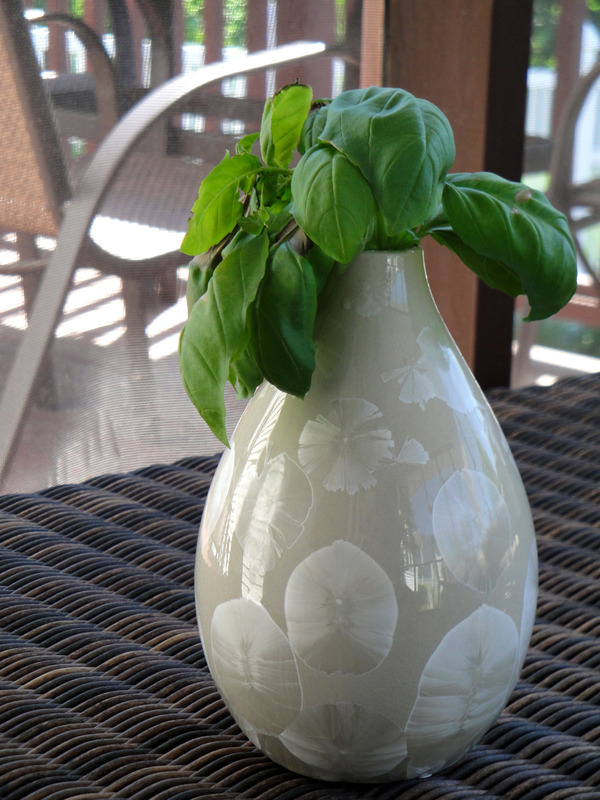 The vase was so perfect…that I left my clippings in the vase for just over a week…and viola! The clippings (3) grew roots!! I understand that this is NOT rocket-science…but it certainly wasn’t planned. 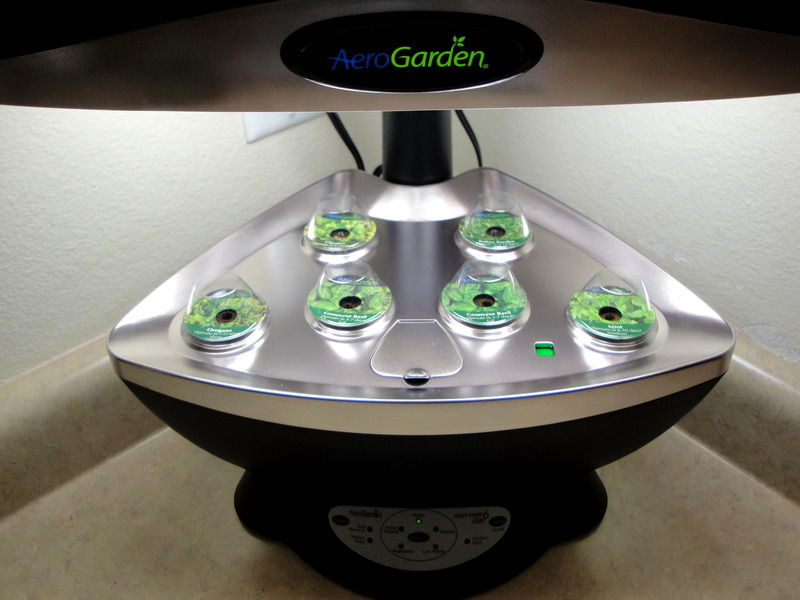 Now…not only do I have plenty of herbs growing in my AeroGarden, but also have “new” plants to pot in soil! Tonight I share with you a couple of my favorite things…a delicious salad and Palmermo’s Primo Thin Pizza! 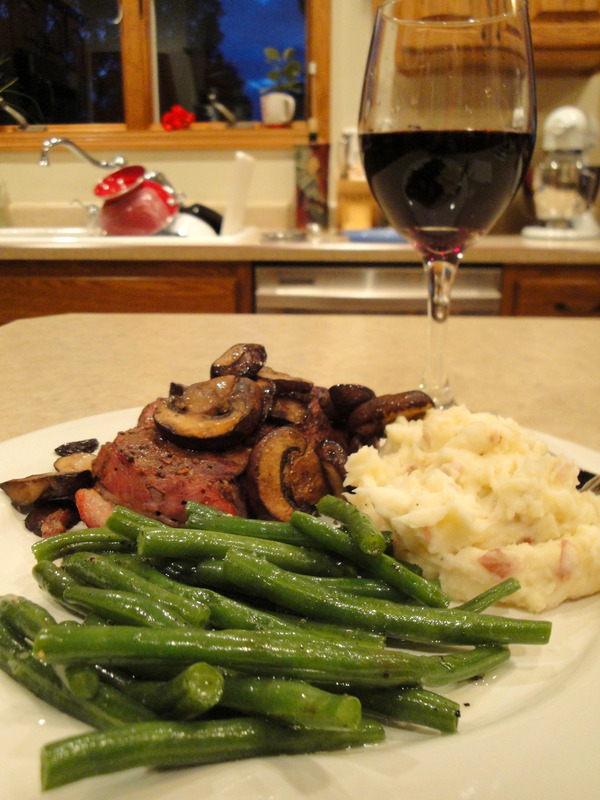 It’s true…there are nights that I just DON’T feel like cooking. For example….the few days AFTER Mother’s Day weekend. Seriously, I was done in the kitchen for a few days. And whenever one of these nights hit me, my trusty standby meal is a good size salad and frozen pizza. But not just ANY frozen pizza…it has to be Palmermo’s Ultra Thin Crust Pizza! 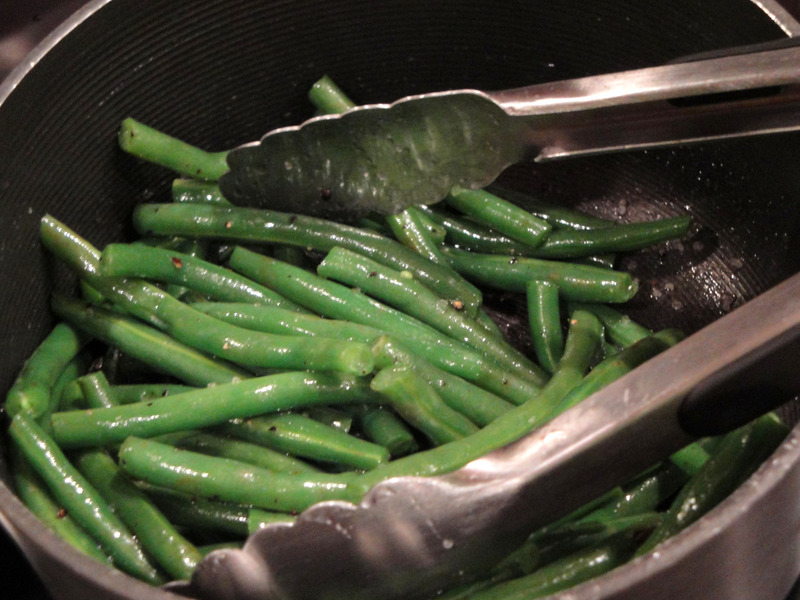 It is flavorful, crunchy and light. 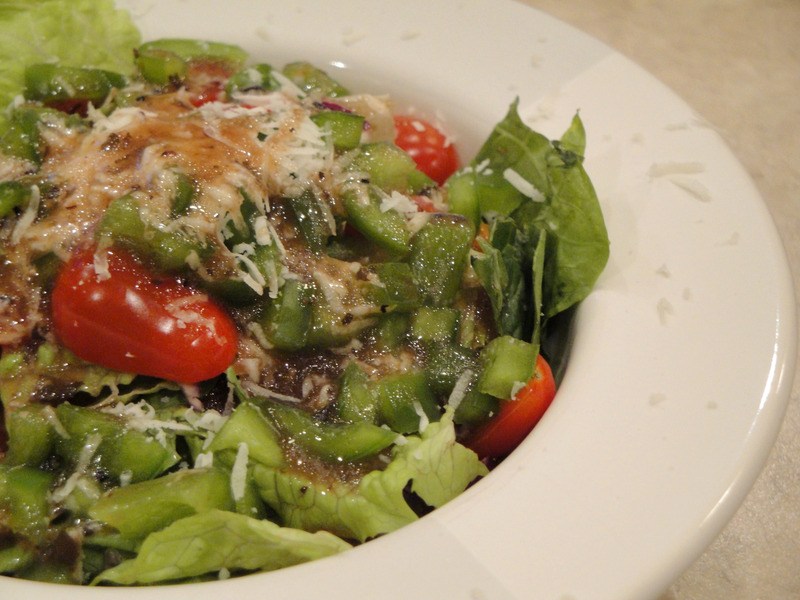 You know how to make a salad…throw all of the veggies in a bowl…and top with cheese and dressing! 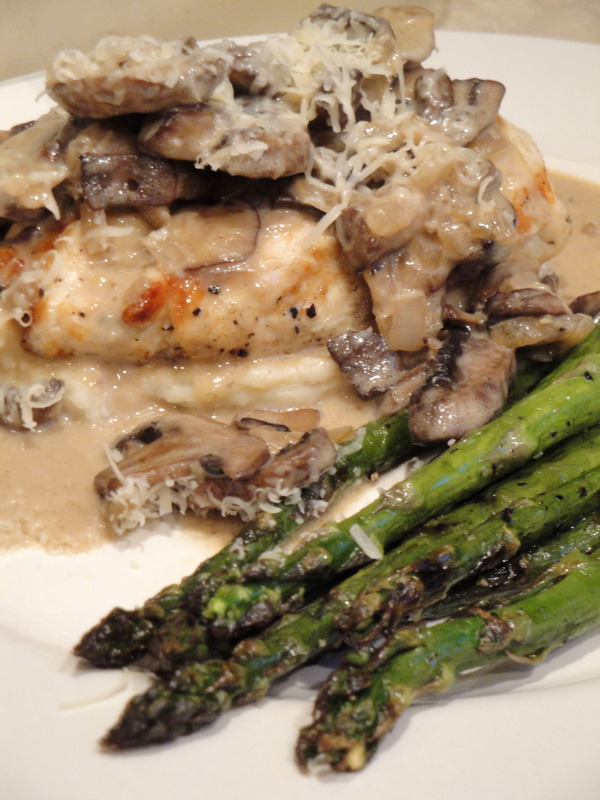 So there you have it…a quick, delicious meal when you just DON’T feel like cooking! 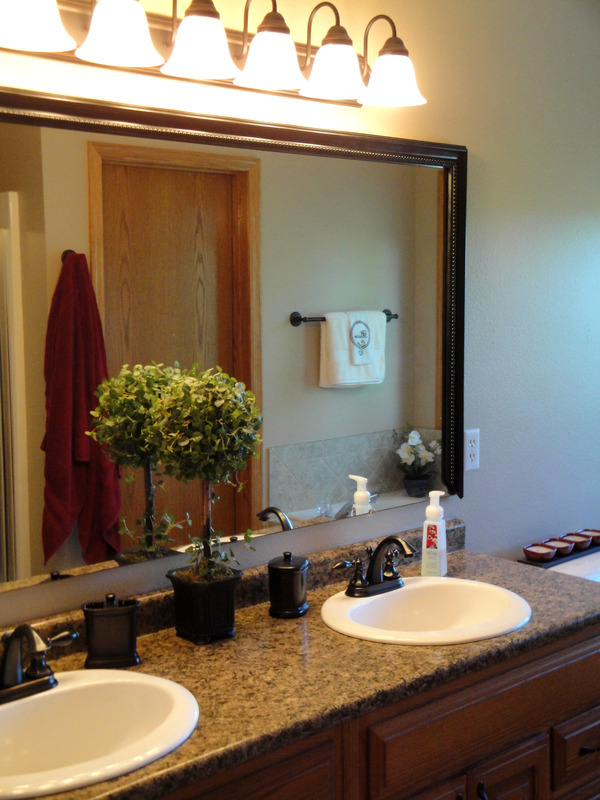 And in the half bath off the kitchen, ladies and gentlemen, the finished product…. 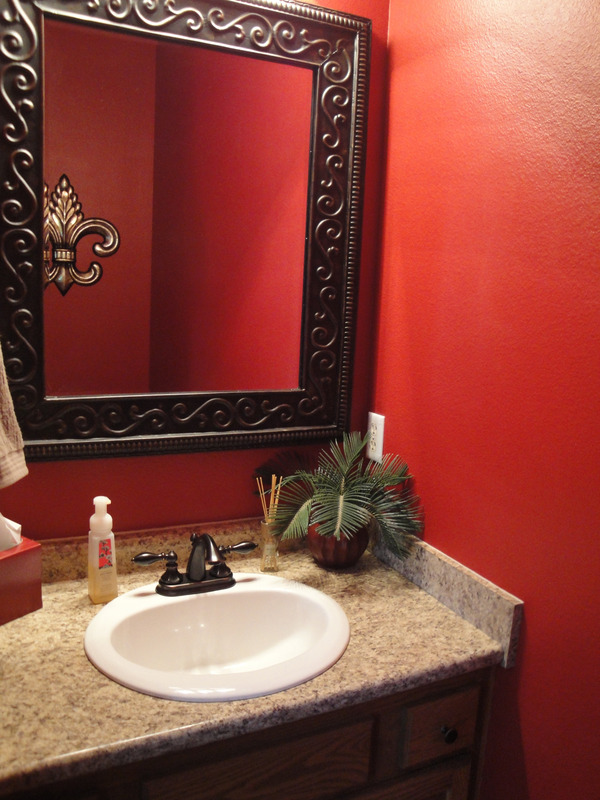 I haven’t posted pics of the guestbath…still waiting on fixtures. But for all of your hardwork….Thanks Buddy! All that leads me to today’s recipe(s)….while Ryan whipped up a new look in the bathrooms….I whipped up PANINIS for lunch! One loaf of foccacia from Panera will make 2 sandwiches. Cut the loaf in half and then slice the loaf open (like a bagel). 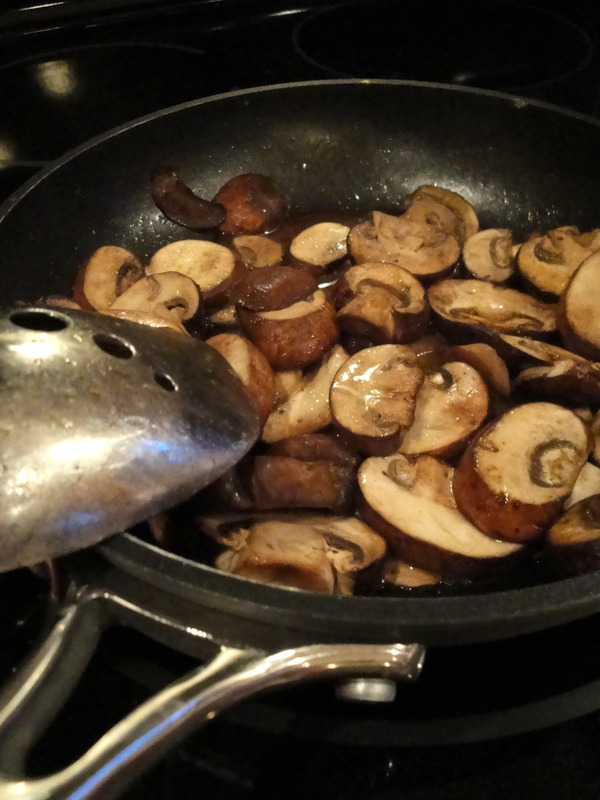 In a small bowl, combine EVOO and Balsamic Vinegar. Using a brush, spread this mixture over the bread. Layer salami, provolone, and vegetables. Place sandwich on Panini maker for approx 5 minutes, until sandwich is heated through and cheese is melting. 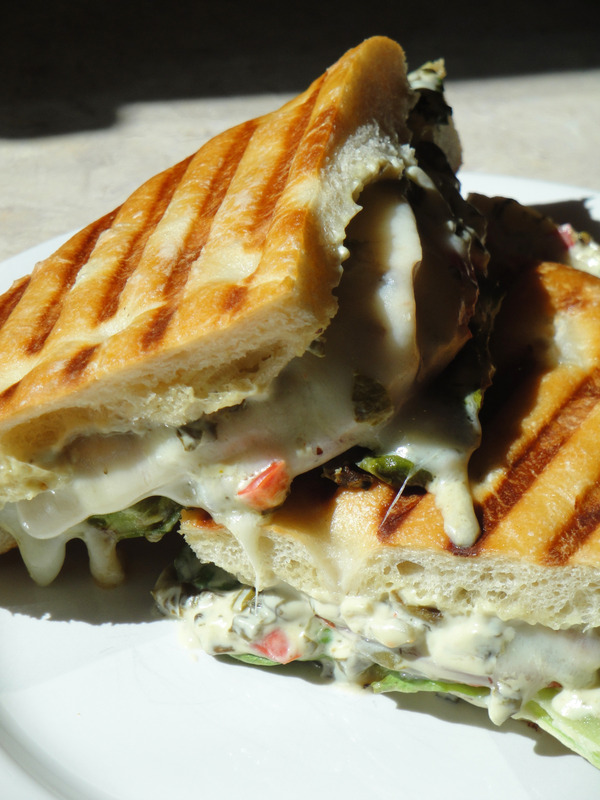 And since mom was up for a little lunch, I thought I would make a panini a little more her style as well. 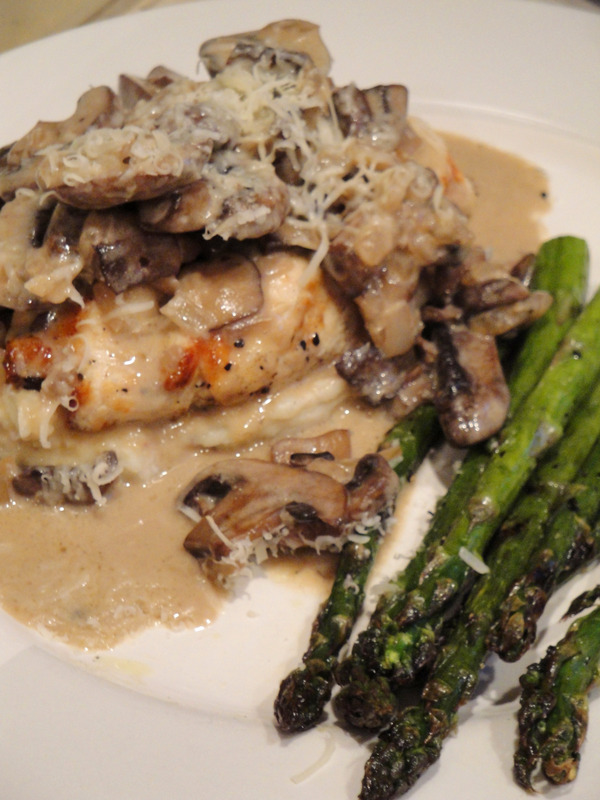 Brush olive oil on both sides of chicken breast. 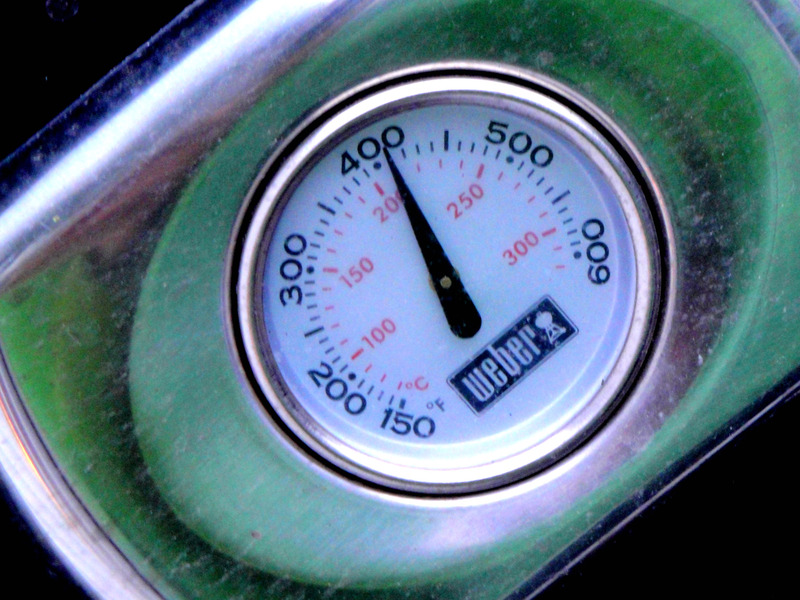 Grill at 400 degrees for 6-7 minutes per side or until cooked through. While chicken is grilling, spread Creamy Spinach dip (amt to your liking) over the inner sides of the foccacia. Layer provolone, lettuce and tomato. Add grilled chicken breast. Place sandwich on panini maker for approximately 5 minutes or until heated through and cheese is melting. Of the two sandwiches, the Creamy Chicken and Spinach was definitely the best! The Italian panini was also great…but since Ryan & I LOVE our Oakville Grocery sandwich…we’ve decided we prefer this classic cold. Try it…and let me know what you prefer! Do you know what today is? Yes…today is FRIDAY (TGIF! )…it is also May 21, 2010…my husband’s 30th birthday. And that is reason to celebrate! 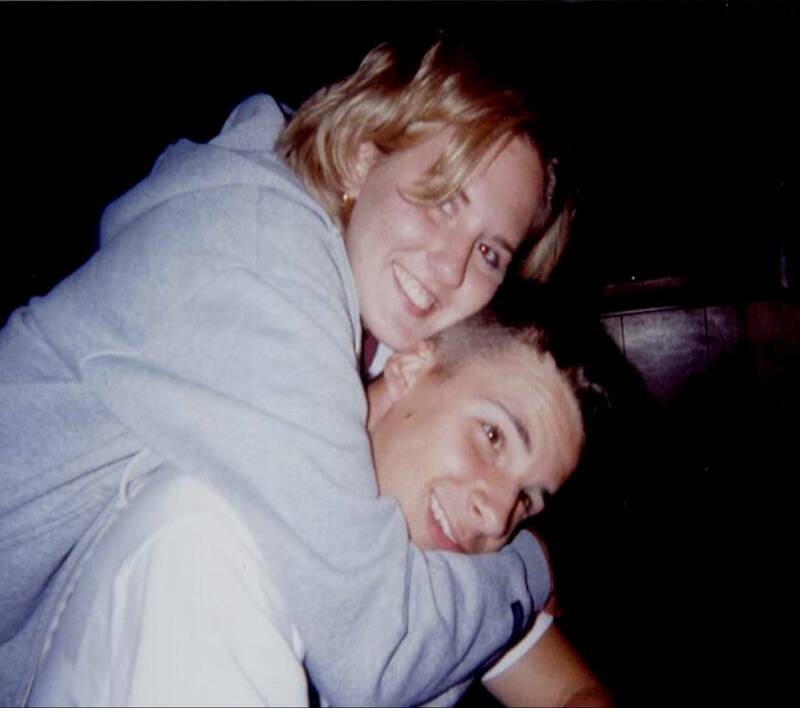 And now…here we are…moving into yet another decade. Enjoy your weekend in DC & I look forward to celebrating with you when you return! CHEERS! Speaking of “Cheers”…I intend to celebrate Ryan’s birthday and the beautiful forecast (Saturday: Mostly Sunny & 82 degrees!) with a Red Wine Spritzer…or 2! Ahh…they are my favorite. 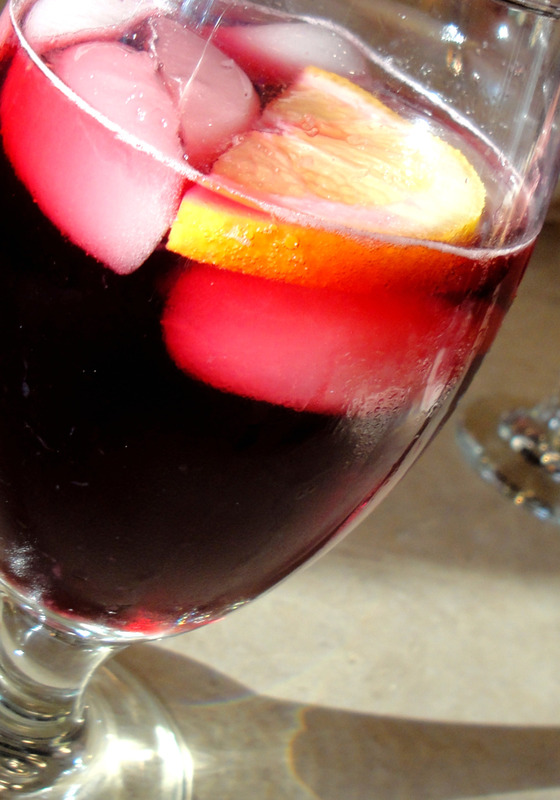 I usually make my Red Wine Spritzers individually, tho you could make them by the pitcher. Begin by filling your glass with ice. Squeeze 1/4 of a lemon into the glass. Pour red wine into glass until 1/2 – 3/4 full. Top with diet 7Up and garnish with a lemon wedge. This will be your new favorite summer beverage…I promise. Enjoy! Sticky Buns for my Honey Buns! My mom is crazy about some things…Cinnamon Rolls and Sticky Buns being two of them! As my last day with mom approached on Mother’s Day weekend, I knew I had to send her off that Monday morning with sweet rolls of some kind. And after doing some searching on foodnetwork.com, I decided on a modified version of Barefoot Contessa’s Sticky Buns. 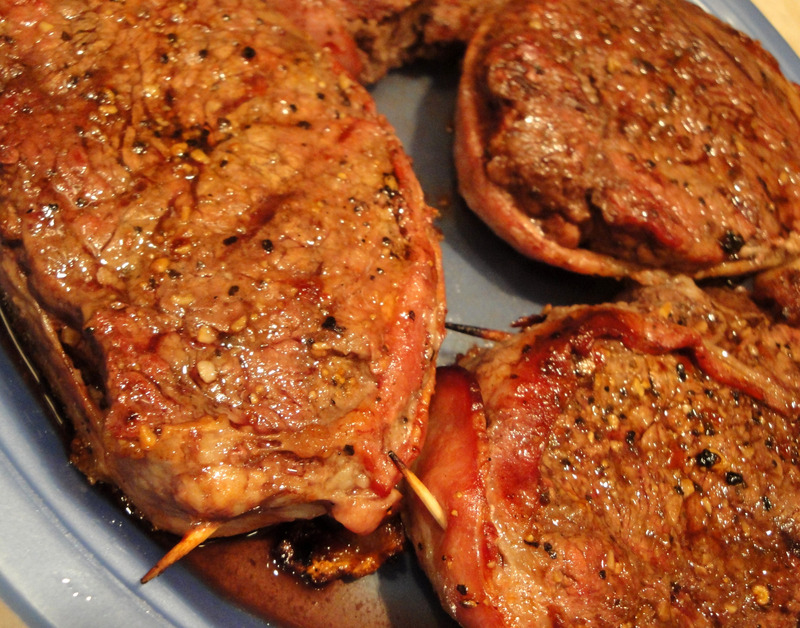 First of all…I love Barefoot…and secondly, the recipe looked so fast, easy, and scrumptous. Preheat the oven to 400 degrees F. Place a 12-cup standard muffin tin on a sheet pan lined with parchment paper. In the bowl of an electric mixer fitted with the paddle attachment, combine the 12 tablespoons butter and 1/3 cup brown sugar. Place 1 rounded tablespoon of the mixture in each of the 12 muffin cups. Distribute the pecans evenly among the 12 muffin cups on top of the butter and sugar mixture. Lightly flour a wooden board or stone surface. Unfold 1 sheet of puff pastry with the folds going left to right. Brush the whole sheet with the melted butter. Leaving a 1-inch border on the puff pastry, sprinkle each sheet with 1/3 cup of the brown sugar, 1 1/2 teaspoons of the cinnamon, and 1/2 cup of the raisins. Starting with the end nearest you, roll the pastry up snugly like a jelly roll around the filling, finishing the roll with the seam side down. Trim the ends of the roll about 1/2-inch and discard. Slice the roll in 6 equal pieces, each about 1 1/2 inches wide. Place each piece, spiral side up, in 6 of the muffin cups. Repeat with the second sheet of puff pastry to make 12 sticky buns. Bake for 30 minutes, until the sticky buns are golden to dark brown on top and firm to the touch. Be careful – they’re hot! Unless you are like me…..I prefer my sticky buns warm…so enjoy one while they are still hot! Heavenly. Preheat the oven to 350 degrees F. Lightly oil and flour 3 (9 by 1 1/2-inch round) cake pans. Divide the cake batter evenly among the prepared cake pans. Place the pans in the oven evenly spaced apart. Bake, rotating the pans halfway through the cooking, until the cake pulls away from the side of the pans, and a toothpick inserted in the center of the cakes comes out clean, about 30 minutes. Remove the cakes from the oven and run a knife around the edges to loosen them from the sides of the pans. One at a time, invert the cakes onto a plate and then re-invert them onto a cooling rack, rounded-sides up. Let cool completely. Frost the cake. Place 1 layer, rounded-side down, in the middle of a rotating cake stand. 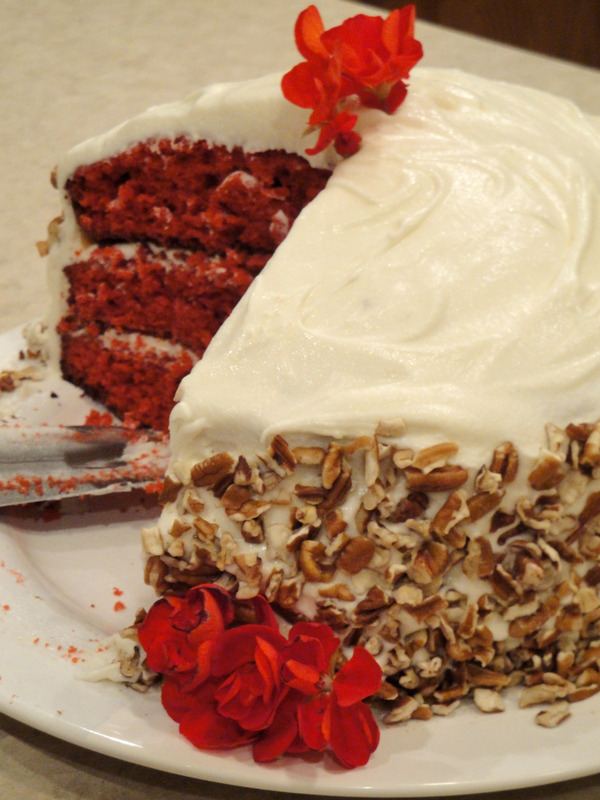 Using a palette knife or offset spatula spread some of the cream cheese frosting over the top of the cake. (Spread enough frosting to make a 1/4 to 1/2-inch layer.) Carefully set another layer on top, rounded-side down, and repeat. Top with the remaining layer and cover the entire cake with the remaining frosting. Sprinkle the top with the pecans. Reduce the speed of the mixer to low. 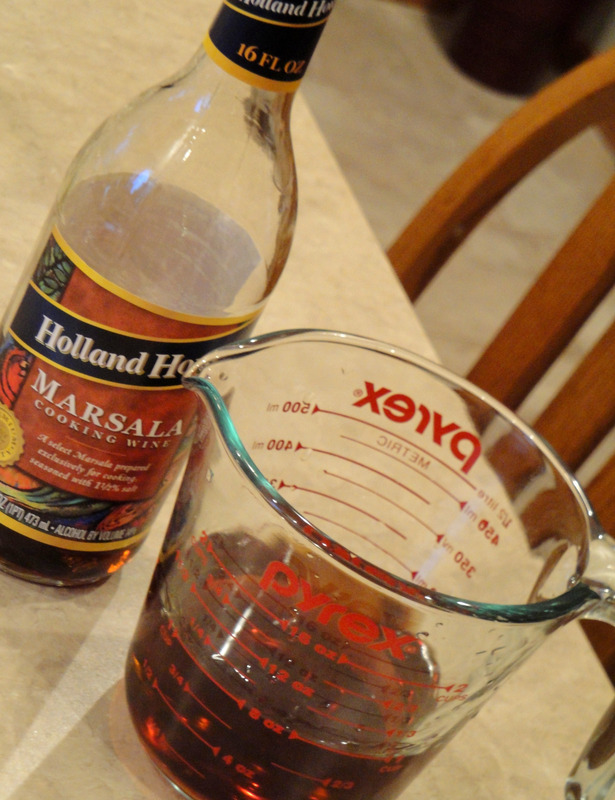 Add the vanilla, raise the speed to high and mix briefly until fluffy (scrape down the bowl occasionally). Store in the refrigerator until somewhat stiff, before using. May be stored in the refrigerator for 3 days. Mmmm mmm mmm! Slice and Serve! With only four of us to enjoy this delicious cake, there was plenty for Mom to take back to Wisconsin. I hope it travelled well…especially with that extra long stop at Diamond Jo Casino in Dubuque. Ahh…I suppose it was worth it…that jackpot win of $1300! Congrats Marshy! Anyone who knows me well…knows I LOVE pizza….authentic Italian pizza, the tasty American version, and of course, our homemade ‘Zza! I remember when Ryan and I were planning our wedding in 2005, he asked me what I wanted for the rehearsal dinner and without hesitation, I insisted PIZZA! And not just any pizza, but the pizza we grew up eating together…the pizza we still look forward to when we go home to Marshfield, WI…the pizza we buy unbaked and frozen just so we can lug it back to Iowa…Scotty’s Pizza. My mouth is watering just thinking about it. For those of you who are unfamiliar, be sure to check it out if you ever roll through Marshfield. (http://scottyspizza.com) You won’t be disappointed! 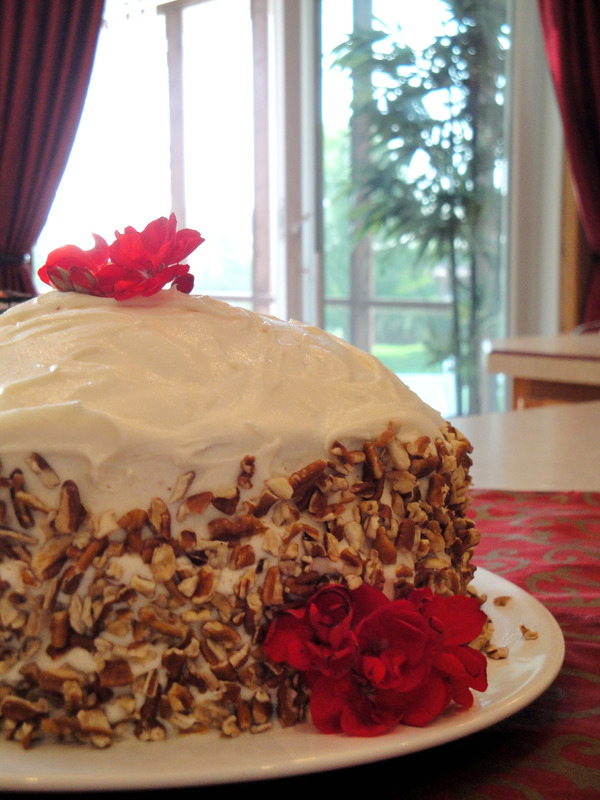 And to think that some swear I am high-maintenance….man, this little lady just wants a slice! So last week, before I headed off to my brief stay in the Sunshine State with good friends, Jeremy & Stephanie, and my longer stay in Philadelphia for work, I wanted nothing other than our homemade pizza. Over the last several years Ryan & I have tailored it specifcally to our tastes….so much so that we began to wonder if anyone else would like it as much as we do. So…the taste tests began. First with my Mom & Dad. Mom said it was “wonderful!”…but then again, she is my Mom! And my Dad, well he loved it too…but let’s be honest, he’d eat just about anything! 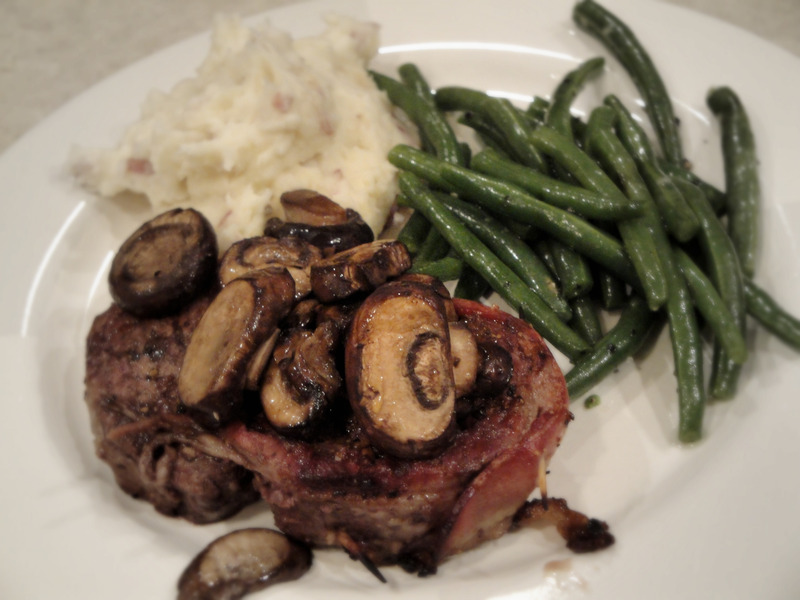 So, on the night before my departure, I invited my friend Kendra over to taste test…her review was, “I.Love.It”. Start by making the pizza crust. 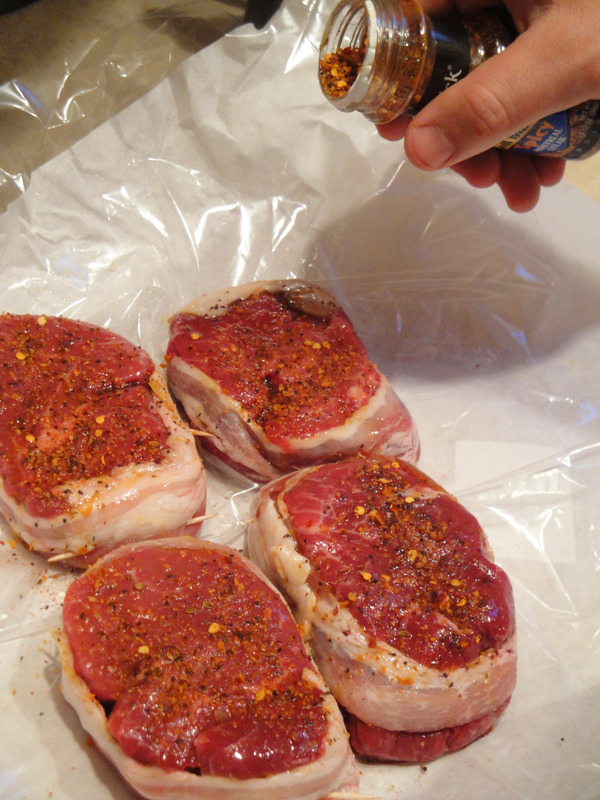 Follow the instructions on the back of the box but ADD a dash or two of Presti’s Spicy Italian seasoning, garlic salt, and garlic powder prior to adding the water. Be careful not to add too much water. 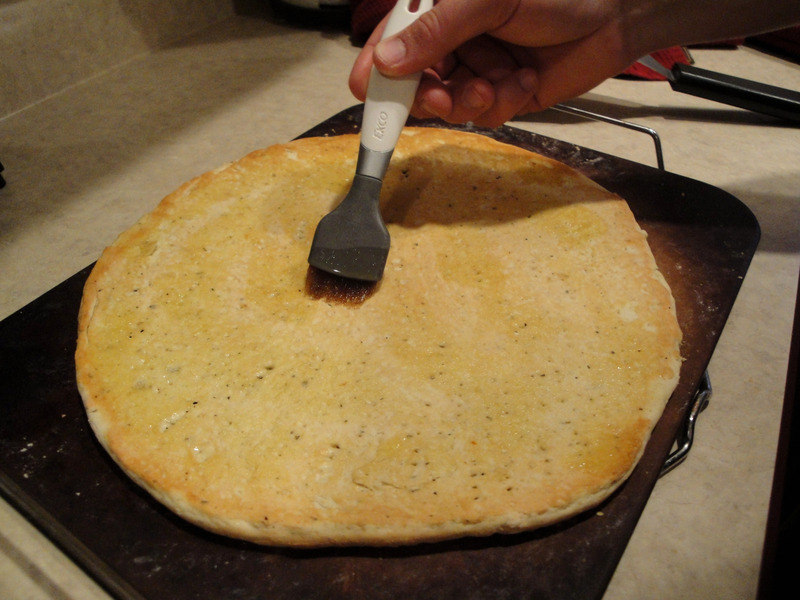 Thoroughly flour your rolling pin and pizza stone. 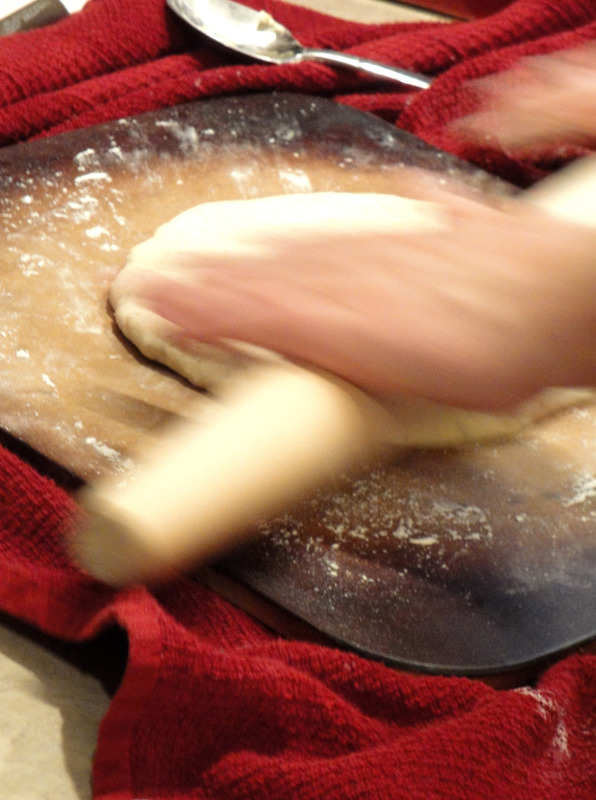 Roll dough to shape and thickness of your liking…we make ours as big as the stone allows…and as thin as possible. 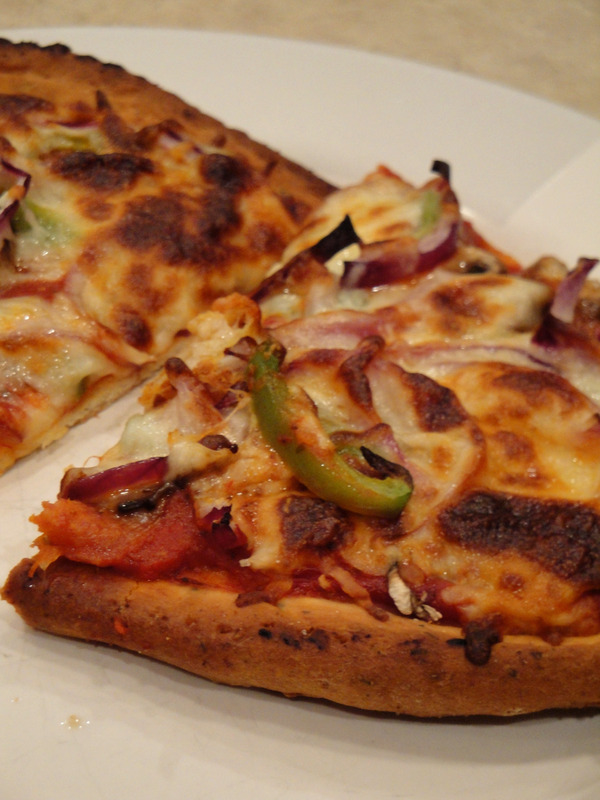 We love the crunch of a perfectly baked thin crust pizza! Bake as directed on package. Once crust is lightly browned, pull it out of the oven and beginning building your pie! Pour half a can of HyVee (or brand of your choosing) pizza sauce into a prep bowl (save the remaining sauce for a second pizza). Add Crushed Red Pepper (to your liking) to sauce and mix. 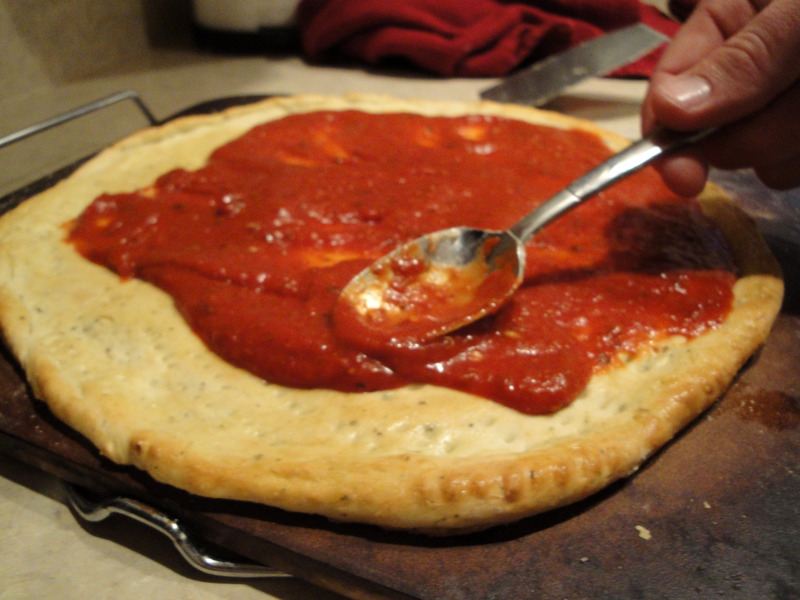 Pour sauce onto crust and spread with the back of spoon until evenly distributed. Dress toppings listed above or substitute your own! 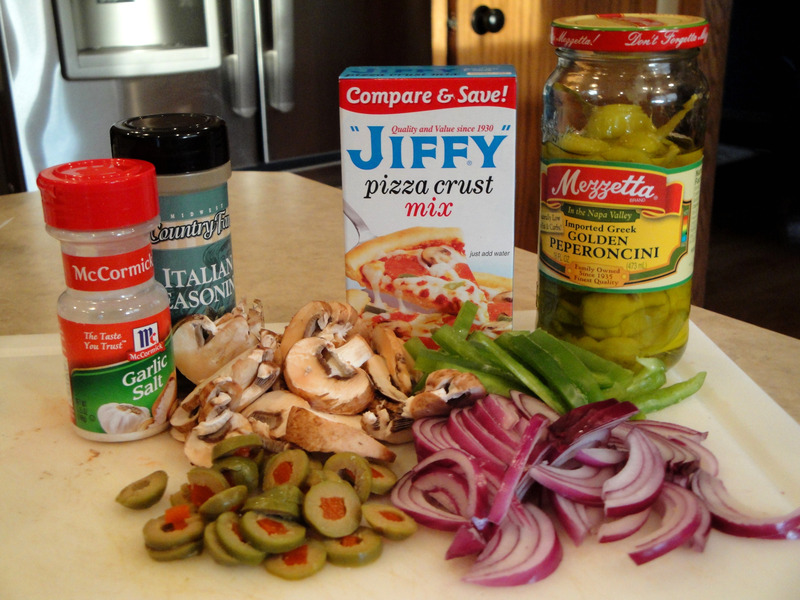 We start by layering pepperoni on top of the sauce, next a layer of thinly sliced baby bella mushrooms, slivers of red onion, green peppers, and green olives (on Ryan’s half only…ick…no olives for me!). Top with ~12oz shredded Mozzarella cheese. Bake for 10-15 minutes…until golden brown. 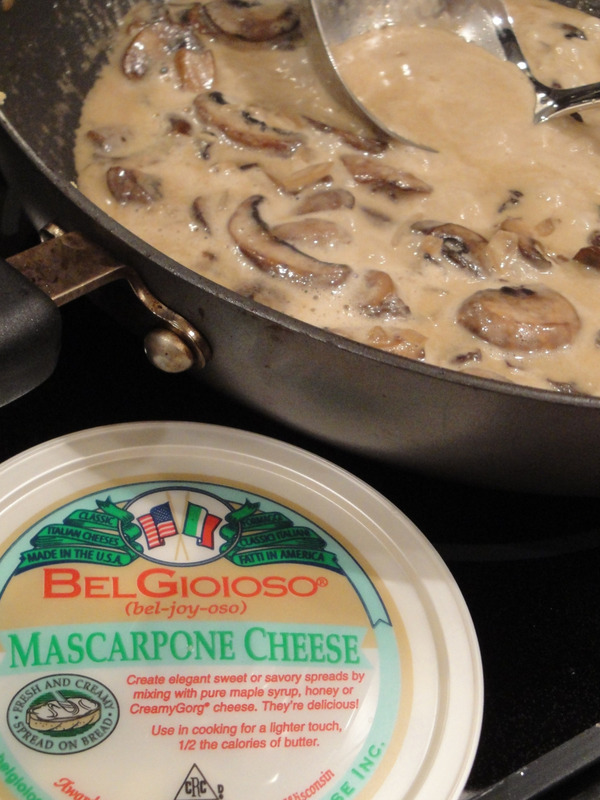 Serve with a pepperoncini or two and enjoy with a cold beer…diet cola…or a chilled glass of Sauvignon Blanc! 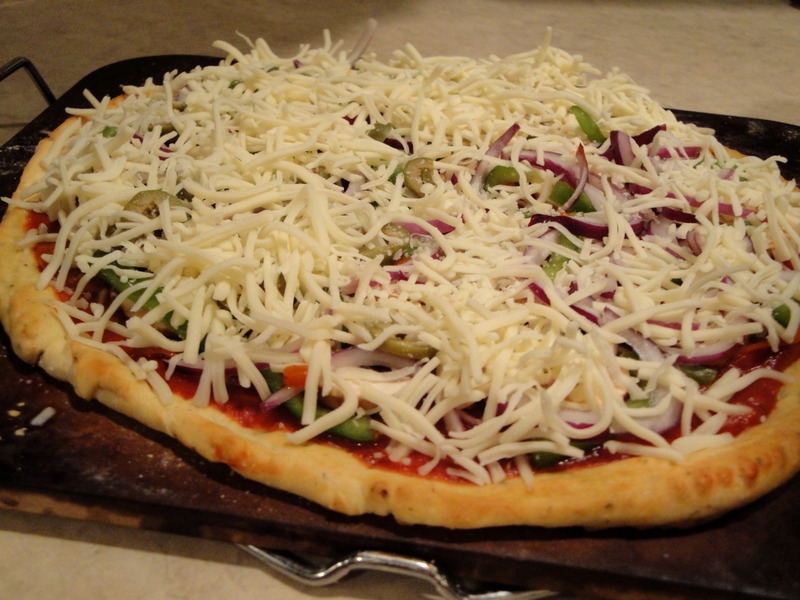 Pizza….one of life’s little treasures!